TGF-β1/p38 signaling represses MT1/2 in human cardiac fibroblasts. 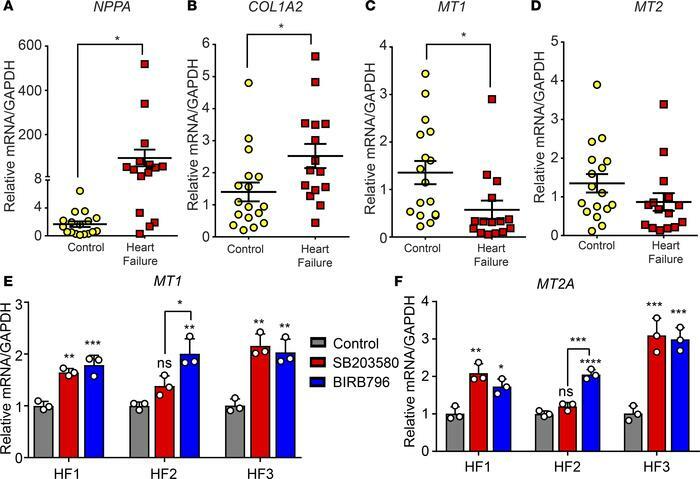 qPCR of left ventricle samples from heart failure patients (n = 15) compared with control cardiac tissue (n = 17) reveals increased (A) Nppa and (B) Col1a2 expression and reduced (C) Mt1 and (D) Mt2 expression in human HF. Primary human fibroblasts were isolated from cardiac tissue obtained from HF patients undergoing ventricle assist device implantation. qPCR analysis revealed the expression of (E) Mt1 and (F) Mt2a from CFs isolated from individual human heart failure patients and treated with 10 μM SB203580 or 5 μM BIRB796. Statistics in A–D were performed using two-tailed Student’s t test. Data in E and F represent the mean ± SD of n = 3 technical replicates. *P < 0.05, **P < 0.01, ***P < 0.001.